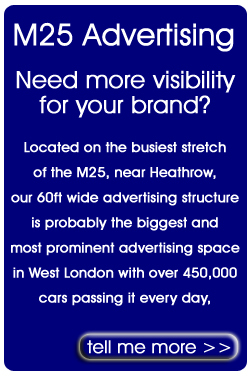 Advertise your business to over 450,000 vehicles passing daily (mostly at a snail's pace!). This has to be one of the best visual advertising opportunities available in West London. The existing structure is 60 feet across by 5 feet deep. (centre section 40 feet ) with overhanging sensor controlled lighting. Newly fenced and surface 1/2 acre yards. ( approx 22000 sq ft ) Excellent 24 hr / 7 day access with 7 metre gates. Good hard standing with running water and 3 phase electric on site. Newly constructed concrete entrance with additional gates for added security. Suitable for most uses including car parking, commercial vehicles storage / repairs, Plant hire operations etc.etc. Available from 3 months up to 13 years. Flexible terms. Priced at £2.00 per sq ft. Please call 01753 652947 for more details. This self-contained 1368 sq ft unit, benefits from being fitted with 2 gas fired low bake ovens, gas fired heating, 3 phase electricity, BT phone line. etc. and as such is built as a vehicle bodyshop unit. It can however be used for most other industrial and storage uses. This 240 sq.ft. office suite. Available with just one month's rent as a deposit. The rental is an all-inclusive price, payable monthly in advance, which includes rates, heat, light, electric, water, parking, furniture if required, and even free WIFI. This 280 sq.ft. office suite, available with just one month's rent as a deposit. The rental is an all-inclusive price, payable monthly in advance, which includes rates, heat, light, electric, water, parking, furniture if required, and even free WIFI. This 560 sq.ft. 2-room ground-floor office suite is available with just one month's rent as a deposit. The rental is an all-inclusive price, payable monthly in advance, which includes rates, heat, light, electric, water, parking, furniture if required, and even free WIFI. This 296 sq.ft. office suite, available with just one month's rent as a deposit. The rental is an all-inclusive price, payable monthly in advance, which includes rates, heat, light, electric, water, parking, furniture if required, and even free WIFI. This 448 sq.ft. 2-room office suite over 2 floors with seperate stair case and beamed vaulted ceiling. Available with just one month's rent as a deposit. The rental is an all-inclusive price, payable monthly in advance, which includes rates, heat, light, electric, water, parking, furniture if required, and even free WIFI.